Say “too-da-loo” to unsightly tear stains with NaturVet’s Tear Stain Supplement! These soft and tasty chews are made in the USA without wheat and feature lutein—a carotenoid vitamin that’s related to vitamin A and often found in vegetables and fruits like broccoli, kale, spinach, kiwi, grapes and more! This veterinarian formulated supplement is also crafted with other natural active ingredients to support your BFF’s immune system and helps lubricate mucous membranes to stop tear stains, so you can see your pet’s loving eyes again! Helps eliminate unsightly tear stains from the inside out. Helps support your sidekick’s immune system and lubricates mucous membranes to help with tear stains. Comes in a palatable soft chew your pet will enjoy. Features lutein—a vitamin that’s closely related to vitamin A and found in many fruits and vegetables. Veterinarian formulated in the USA in an FDA audited, Current Good Manufacturing Practice (cGMP) compliant facility. HAZARDS TO ANIMALS: Safe use in pregnant animals or animals intended for breeding has not been proven. Absorption of drugs taken simultaneously may be delayed. If animal’s condition worsens or does not improve, stop product administration and consult your veterinarian. WARNING: For animal use only. Keep out of the reach of children and animals. In case of accidental overdose, contact a veterinarian immediately. Due to the tasty nature of our products, do not leave package unattended around pets. Active Ingredients: (Per 1 Soft Chew) Cranberry Extract 105 mg, Oregon Grape Root 34 mg, Vitamin C (Calcium Ascorbate) 34 mg, Colostrum Powder 25 mg, Marshmallow Root 23 mg, Linolenic Acid Omega-3 (Flaxseed) 10 mg, Lutein 2.5 mg, Linoleic Acid Omega-6 (Flaxseed) 2.4 mg.
Inactive Ingredients: Brewer's Yeast, Citric Acid, Fish Oil, Flaxseed Meal, Glycerin, Lecithin, Natural Flavoring, Oat Groats, Rice Bran, Rice Flour, Rosemary, Sorbic Acid and Vegetable Oil. 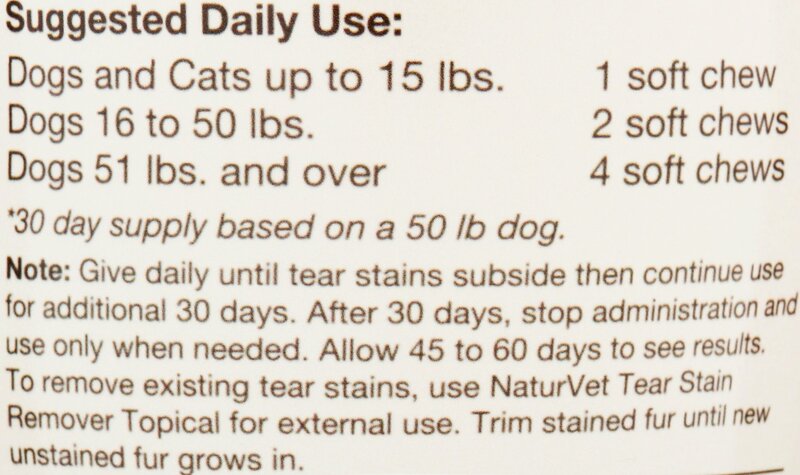 Note: Give daily until tear stains subside then continue use for additional 30 days. After 30 days, stop administration and use only when needed. Allow 45 - 60 days to see results. 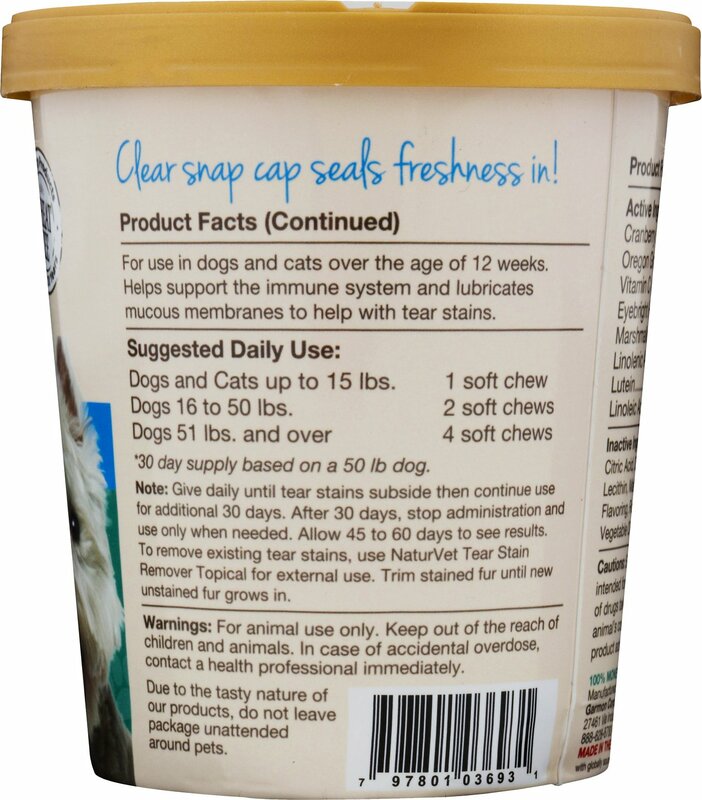 To remove existing tear stains use NaturVet® Tear Stain Remover Topical for external use. Trim stained fur until new unstained fur grows in. 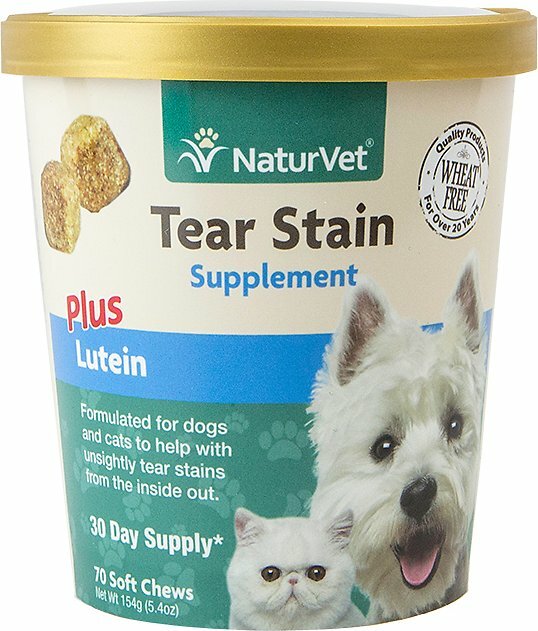 It’s only been about 2 weeks since my Lhasa Apso started taking the Tear Stain supplement, but his “tearing” has certainly been reduced if not eliminated. No new stains under his eyes. My 8 yr old chihuahua has bad allergies that make her look like a raccoon. After 2 weeks on Tear Stain the stains are diminishing. I just wish it was sold in a larger size. This product was recommended to me by another of your Chewy customers. I tried it, and saw results in just a few days. Love it! I cannot speak to the quality or efficacy of this product, but I will say that my cat, who is usually pretty enthusiastic about whatever treats he is given, would not touch these. Not from my hand, not on the ground, not in pieces hidden in his regular food-- nothing. Maybe these are more appealing to dogs? I don't know, but I'm bummed he seems so grossed out by these, because he could really use the help with a constantly tearing eye. This product actually works! I have a pomeranian & a chiwawa/pickenes mix and have had them on this for a couple of years now. They both have allergies which gives them runny eyes and this keeps the stains away! My Mickey loves these and they seem to help! Received them undamaged and in a timely manner! Dog has been on them a while and seems to reduce the problem! our maltese is a walking ad for this product! People often ask why our white maltese doesn’t have the red stains under her eyes. We tell them about Tear Stain and to get it at Chewy.com!